What brings fear into the hearts of cat owners? Bath time probably is on the top of the list, but bringing your cat to the vet comes in a close second. Getting an unwilling cat into a carrier can be dangerous to the human and the cat. Not to mention the serenade many cats provide their owners during the car ride. Veterinarians are aware of these challenges, we have cats of our own we need to bring to work, too! The American Association of Feline Practitioners (AAFP) has addressed improving our feline patients’ experience developing the Cat Friendly Practice (CFP) certification. We have been a silver level CFP practice for a few years, and after our remodel, we are proud to say we have reached the Gold level of certification. What does CFP certification mean? We have met many different standards set forth by the AAFP aimed to decrease the stress experienced by a cat (and their owner) when they come to visit. 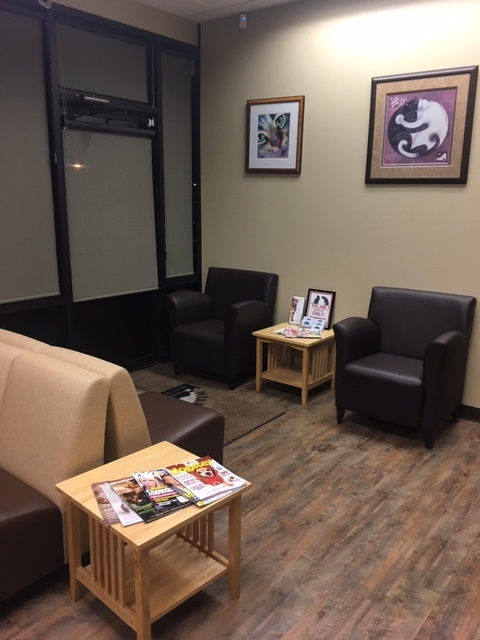 When we remodeled the clinic, we took our feline patients into consideration. We now have two rooms that are designated for cats. We didn’t use stainless steel tables, and we place yoga mats or towels on the table to improve the experience. We use pheromone therapy to help calm the cats. We have diffusers in the rooms and will spray towels with pheromone to wrap a cat or cover a carrier. Although it is our goal to get cats into the exam room as quickly as possible, we do have a cat-specific waiting area when they have to wait for a room. We will often cover these cat’s carriers with a pheromone towel and we make sure the dogs stay on their side of the waiting room. We now also have a cat only ward. Because some cats are stressed by their own reflection, we avoided stainless steel cages and instead have cat condos with non-reflective surfaces. We play soothing music and also have a pheromone diffuser in the cat ward. In the condos, there is a shelf for the cat to rest on and we put a “sleeping bag” or “cat teepee” in the condo, so shy cats can hide during their visit. Our staff has regular training on how to handle cats in the gentlest manner possible. Ideally, we do everything in the exam room. In cases when a cat is too nervous we recommend sedation, by mouth or injection, to perform treatment with as little drama as possible. When gabapentin is given by mouth to a cat two hours prior to an exam, they are often much more relaxed and amenable. We also have toys and treats in the each of the cat exam rooms to try to relax a nervous patient. Our doctors are flexible as to where they examine the cat. If the kitty would prefer to be examined on the doctor's lap or in a ½ shell of a carrier or on a baby scale, that is where we do the exam. Another goal of the CFP program is to help teach owners how to make it easier to get their cat to the vet. They have a really good handout, “Getting Your Cat to the Veterinarian.” We have a link to it on our website, wildernessvet.com, under the new patient's tab. Looking forward, our next goal is to become a certified Fear Free practice. This is a program that is very similar to the CFP but also includes our canine friends. I am attending a Fear Free training program in February. We already have incorporated many Fear Free recommendations and I look forward to fully integrating the program into the practice. If you have any questions or suggestions, feel free to contact me, [email protected]. You can also find us on Facebook and our website, wildernessvet.com. I hope you are all having a great start to 2017, and remember to keep your pets inside when it is bitterly cold.